You can come out now. The coast is clear. The fraternity party is over. The Houston Phi Slamma Jammas, that Texas chain-saw gang with the tall pledge from Africa in the middle, have finally stopped stuffing college basketball's x's and o's through every hoop they could drape their magnificent bodies over. And curfew came so suddenly: Time running out in the NCAA championship game. A shot in the air. The ball short of the rim. Whooomp! When the final astounding dunk of the even more astounding 1982-83 season was there for the taking in Albuquerque last Monday night, it was only fitting that an improbable sophomore named Lorenzo Charles from an even more improbable North Carolina State team was the one to get it. Charles started the season in the doghouse for stealing two pizzas. He ended it in the penthouse by stealing a national title. Or was it in a frat house? By the time the Wolfpack's stunning 54-52 upset of heavily favored Houston had filtered through the haze of several dozen pitchers of margaritas, the new champions had been turned into Theta N.C. State-a. "One Slamma Jamma...One Slamma Jamma," the Pack, whose 10 losses were the most ever by a champion, shouted in the locker room afterward. The players were fully aware that they had held Houston's vaunted dunkarama to one solitary stuff while they had registered two: Thurl Bailey's rebound jam to begin the game and Charles's catch and jam to end it—a nice, clean iron(y) sandwich if there ever was one. But as intelligent as N.C. State Coach Jim Valvano's game plan was—on offense, to get the lead and slow the tempo; on defense, to play behind the Cougar leapers and deny them their beloved tomahawk repertoire; in the crunch, to foul, foul and foul some more to force the hopeless Cougar free-throw shooters to beat State from the line—and as diligently as his brave, scrappy Wolfpack worked it to perfection, even the most rabid Cinderella lover had to recognize that Houston gave away this championship just as surely as the Wolfpack took it. Would He Rather Be A Unitas Or A Mantle? Much Traveled Lou Saban, the football coach who can't say no, is now in his 18th job, at obscure Central Florida. Will this one cap his career? How Punchy Was Slapsie Maxie? As long as there are rims to trash, which Houston did plenty of in its spectacular 94-81 pounding of Louisville in the semifinals, there will be questions about Coach Guy V. Lewis' strategy against North Carolina State. Why did he stay with All-America Forward Clyde Drexler so long in the first half that The Glide picked up his fourth foul with 2:47 left in the period? (Drexler was even in the game for more than a minute after that.) Why did Lewis not order his team to give a foul—Houston committed but five in the second half—somewhere over the last frantic seconds to disrupt the Wolfpack's brilliant guard tandem of Sidney Lowe (eight assists and five steals) and Dereck Whittenburg (14 points)? Obviously, they intended to pass and shoot the ball, respectively, for all the marbles. Earlier, the Cougars had overcome a somnambulant first half, at the end of which they trailed 33-25. During those 20 minutes State's senior Forward Bailey thurly surprised them with 15 points, all the scoring he would do. Houston came back with 15 points of its own to open the second half, while the outclassed Wolf-pack could get only two in nearly 11 minutes of chilly shooting. But after Akeem Abdul Olajuwon, the Nigerian monolith-child who had already scored 18 of his 20 points and gathered most of his 18 rebounds, came out for a rest with Houston leading 42-35 and 10:04 to play, Lewis had his team waltz into a spread delay—if you can imagine disco dancers like Larry Micheaux, Benny Anders, Michael Young and Drexler waltzing. Lewis' ploy not only turned the game around, it probably lost it for his club, because when the Phi Slams can't jam, they take it on the lam: They don't shoot particularly well from outside and are worse from the foul line, where they canned 60.9% of their shots on the season, 57.3% during the tournament and 10 for 19 in this game. "I have confidence in that offense," Lewis said later. "I wanted to pull State out and get some layups. We only got one." But then Lewis said, "Just as everybody knew it might, our foul shooting caught up with us." 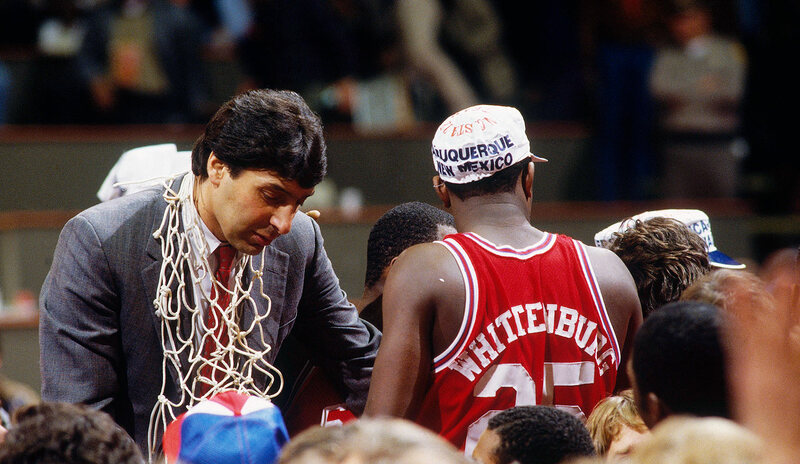 Down the sideline, Valvano was scurrying about, twitching his ample nose—"biggest in Final Four history," he had surmised—and keeping "the dream," as he kept calling it, alive. Following some deadly outward-bound heaves by Whittenburg, Lowe and still another tiny bomber, Terry Gannon, and aided by a passel of nervous Houston turnovers, the Wolfpack crept to within four points (52-48 at 3:04). State was unable to tally anything underneath, its main inside operators, Cozell McQueen and Charles (Co-Rilla and Lo-Rilla, respectively, to their teammates), having long since been snuffed by Olajuwon. But now Valvano was orchestrating fouls, shouting and pointing and machoing the game in his inimitable Fonzie fashion. Whittenburg—an enchanting clutch shooter in the Land of Enchantment—responded by hitting consecutive baskets to tie the score at 52-all with 1:59 to play. State's Cardiac Pack had advanced through the tournament whipping Pepperdine, UNLV and Virginia, all in the final seconds after the losers failed at the line. They'd gone 5-4 with four other teams ranked No. 1 at some time during the crazy season. "We'd been there so often," Valvano said. "We didn't want anybody else determining the outcome." And so, at 1:05 Whittenburg made one last foul, hacking Houston's freshman point guard, Alvin Franklin, who missed one last foul shot. McQueen corralled the crucial rebound, and following a State time-out with 44 seconds to go, the Pack worked the clock. Bailey, trapped in the corner, threw a shaky pass to Whitten-burg at midcourt. The lightning-quick Anders, inserted in the lineup for just such a chance, gambled for the steal and nearly made it, but Whittenburg whirled to cut off Anders with his body and started dribbling. Panicky now, Whittenburg searched for the basket and the scoreboard at the same time and found neither. Three seconds remained when he jumped and let fly approximately 35 feet from the goal. "I was happy to see it go," Gannon remembered later. "I just hoped it wouldn't rebound long. All the time I saw Lo [Charles] wide open under the basket." For the first time in three days Olajuwon was not under there, too. Said Charles, "When I jumped, I thought the ball was short. But Akeem didn't see me. He just stood there. He didn't even go up. He didn't even go up," Charles kept repeating. "I was up there all by myself." Earlier in the week, the Phi Slamma Jammas had commanded attention as no team has in the recent history of the Final Four. Why, the careening Cougars even stole the spotlight from the host city, where under all that howling dust and tumbling tumbleweed beats a hospitality of pure gold. Or at least of silver and turquoise. Olajuwon appeared at Friday's practice session as spiffy as could be in Walkman cassette waistband and matching earphones. "One thing bothers me in America," he said. "You people have wrong ideas about Nigeria. You think we live in huts. Lagos is a big city. We have Pat Benatar in Lagos." For sure, Olajuwon is no hick. When asked whether he preferred basketball or his native sport, soccer, Olajuwon replied basketball, "because of the media." Before their astounding pick-your-favorite-dunk exhibition in their semifinal against Louisville, the Houston players upstaged the other semi, the Cinderella Bowl. That turned out to be an interminable 67-60 bore as Georgia's surprising Under-Dawgs withered under the attack of the poised Wolfpack. Georgia began by missing 19 of its first 23 shots. Its best player, James Banks, could do no better than shoot three of 15 in the first half, and the Wolfpack took a 33-22 lead at intermission. With nearly 12 minutes left in the game, and State in the process of stretching its lead to 59-41, who should appear in the runway leading to the court but Phi Slamma Jamma. As the PSJs, already suited up in full uniform, filed into their front-row seats behind the N.C. State bench, a mighty roar went up from the Houston section. About that time, the Dawgs abandoned the pound, climbed back into the game and prolonged the agony for everybody who had only showed up to watch the Houston Slamma Jammas and the Louisville Swatta Lottas. "I'm sitting there up 18 and composing my lines," said Valvano. "Then all of a sudden I got no lines left." No lines? Valvano? The guy who had called Saturday's double-header "the A game and the jayvees"? Perish the thought. From the time the Wolfpack surprised North Carolina and Virginia to win the ACC tournament, Rocco and Angelina's boy from Queens, despite wearing a truss to support a painful hernia, has been an instant legend just waiting for the next microphone. Upon landing in Albuquerque, Valvano rushed off the team flight, sprinted into the teeth of the press and announced, "Welcome to the Jim Valvano Show." He said that he felt like Carnac the Magnificent and that, yes, he had held bed check and all the beds were still there. He also said he finished second in a dance contest at The Hungry Bear Thursday night—apparently his hernia didn't hamper his boogieing. At some point between Valvano's monologues, the long-awaited Houston-Louisville duel finally edged its way onto center stage. Or, rather, was engraved onto history. The emotions, weaponry and dynamics of this confrontation were such that they may help explain what happened to the Cougars in the championship game. The Cardinals' Rodney McCray had said Houston was probably the best team "but now they have to go out and prove it." Brother Scooter McCray had labeled the Cougars "a mirror image of us. We have exciting practices, so the game should be fun. The difference is we never lose in practice." Louisville didn't lose the first half either, emerging from 10 ties to take a 41-36 lead. In those first 20 minutes there were many plays of athletic majesty: Olajuwon blocked a Charles Jones power jumper, and Jones blocked an Olajuwon hook dunk. Drexler windmill-jammed once over Rodney McCray and once over Scooter, and Scooter threw one down so fiercely the ball squirted out the side of the net. Oh, it was astonishing stuff all right, even when Lewis whipped his trademark red-and-white towel into Scooter's back after McCray intercepted along the sideline in front of the Houston bench. Lewis said the towel "slipped." But Guy V. got a quick T anyway. The second half, though, belonged to Houston, which switched to a frenetic man-to-man defense. In exactly 3:30 of truly the most breathtaking basketball ever witnessed in these championships, or on any other college court, this bomb of a Houston team detonated. From 49-57 to 66-58, eight points behind to eight points ahead, a 17-1 run if you're scoring. The Cougars' deep bench simply wore down Louisville in the thin Albuquerque (altitude: 5,200 feet) air. "They overpowered us physically," said Cardinal Coach Denny Crum. "At sea level maybe we get beat by 30." Houston's Young, a quiet killer, began the plunder with a jam off a pass from Drexler. Then Drexler slammed after a pass by Franklin. Houston got to 55 when Anders went stride for stride on a breakaway against Louisville's Jones, lifted off, took the ball to the rack and stuck it on him. When Anders surfaced, he punched the air and pointed his finger at the enraptured Houston stands. Several Cougars jumped from the bench to watch the replay on a nearby TV monitor. Then it was time for Drexler, who had 21 points, seven rebounds and six assists on the day, to work his singular legerdemain. After bounding downcourt to within one hop of the rim, Drexler encountered Jones. Drexler: "It's something I work on in practice. I held the ball high to make him think I was going to dunk it. Then I brought it down low so he thought pass. Then I went high to dunk it again. By that time we were both confused." By that time Drexler had triple-pumped, shifted the ball from right hand to left to right again in midair and then viciously flung it down with a two-handed hatchet job. It was your basic play of the century, but only one of the several miraculous moments on this magical afternoon. In the final 12:37 Houston made a remarkable 10 dunks, including six in a row, and had 14 slams altogether. "I've never seen anything like it in a real game," said Scooter. "On behalf of Phi Slamma Jamma, I'd like to say we save our best dunks for the games," said Anders, who also said of Olajuwon, "The big Swahili shocked the entire nation." But on Monday night it was the Swahili who was shocked. In two games at Albuquerque, Olajuwon had gotten 41 points and 40 rebounds, but at the end he was one carom short. His Most Outstanding Player award was little consolation as he walked, still wearing his uniform, to the Houston bus, his Phi Slamma Jamma warmup left behind along with the NCAA championship trophy. Valvano, who had slain the dragon, was still salivating, of course. "How did I like Albuquerque?" he replied to a question. "Albuquerque is the greatest city the Lord ever made. My wife is going to be pregnant—she doesn't know this yet—and I'm going to name the kid Al B. Querque." If Mrs. Valvano doesn't prefer Lorenzo instead. TWO PHOTOSRICH CLARKSON; ANDY HAYT; MANNY MILLAN; PETER READ MILLERWhittenburg's heave from 35 feet was short as a shot but perfect as a pass. Charles grabbed the ball and slammed home the winner. PHOTORICH CLARKSON; ANDY HAYT; MANNY MILLAN; PETER READ MILLERLowe was the high man in the championship game, in assists (eight) and steals (five). PHOTORICH CLARKSON; ANDY HAYT; MANNY MILLAN; PETER READ MILLERMcQueen: the season's last basket case. PHOTORICH CLARKSON; ANDY HAYT; MANNY MILLAN; PETER READ MILLERValvano really knows how to nose 'em out. PHOTORICH CLARKSON; ANDY HAYT; MANNY MILLAN; PETER READ MILLERIn the semis, Bailey (41) thurly bewildered Georgia, getting 20 points and 10 rebounds. PHOTORICH CLARKSON; ANDY HAYT; MANNY MILLAN; PETER READ MILLERAkeem was a dream, with 41 points, 40 rebounds and 15 blocks in the two games.